Some of the world's best known men, including President Bill Clinton, actors Gabriel Byrne and Daniel Day-Lewis and musicians Paul McCartney and Bob Geldof have contributed to a new Irish Hospice Foundation book celebrating the unique relationship between sons and fathers. Larry, Edge, Adam and Bono have all contributed. 'Sons + Fathers', to be published for Father's Day, was inspired by drawings Bono made of his own father, as he reached the end of his life. While the words and images in the new book are mainly of the fathers themselves, they are also revealing about the authors, their sons. 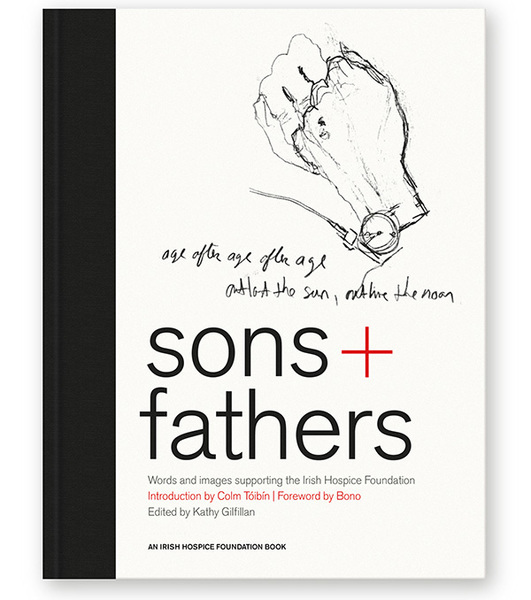 Edited by the writer Kathy Gilfillan, 'Sons + Fathers' is powerfully introduced by author Colm Tóibín. Contributors from the world of film include: John Boorman; Daniel Day-Lewis; Gabriel Byrne; Neil Jordan: Paul Cusack and Colin Farrell. As well as the members of U2, contributors from the world of music include Paul McGuinness, his son Max, Paul McCartney, Bob Geldof, Julian Lennon and Gavin Friday. Literary figures include John Banville; Roddy Doyle; Robert Fisk; Paul Auster; Mick Heaney; Colum McCann; Joseph O’Connor and Salman Rushdie while contributors from the world of politics include President Clinton, Alastair Campbell and Bobby Shriver. Sponsored by Park Hyatt and published in aid of the Irish Hospice Foundation, the book will raise funds for the Irish Hospice Foundation's Nurses For Night Care Service as well as for Hospice Africa Uganda, founded by Noble Peace Prize nominee Dr Anne Merriman. More information and pre-orders here. For my free album on itunes,I thank you,just shows,why I have been a fan for 30 yrs.You made this,American born,first generation,Irish American,been back 12 times "girl" very happy! In my lifetime and perhaps even after that, no group of 4 men has done so much for humanity. To use Bono's phrase "They have given all of us a great life". Spring begins, a seed is planted, and a Tree grows, and all for a really great cause, The Irish Hospice Foundation. These guys do such great work for ordinary people with terminal illnesses at the end of their days. This would make a very interesting documentary too, and raise even more money? For those of you who have the power to make a difference, the Tree that has been planted here should be taken to all countries worldwide to raise funds locally in every country that has Hospices, as they provide our treasured old people with the comfort and dignity they deserve. Nice one Bono! Even from your sick bed you are shining a light, into a dark and damaged Beautiful world. Lets hope others will grab some seeds, and plant a few more Trees. Go on people, walk the walk. It will all come back to you..